To wrap your head around kitchen equipment, sort it into like items – basic equipment, all the tools, what goes in your oven and on your stove and what gets plugged into the wall. Where basic equipment and gadgets & gizmos meet, is a matter of opinion – basic equipment to one may be a gadget or a gizmo to another and vice versa. There are 2 schools of thought when it comes to the tools & toys – less is more or the more the merrier. How you choose to stock your kitchen really depends on how adventuresome you want to get. As long as you have the basics, feel free to lose your mind with the never-ending array of toys out there to add to the fun you’re already having in your kitchen! 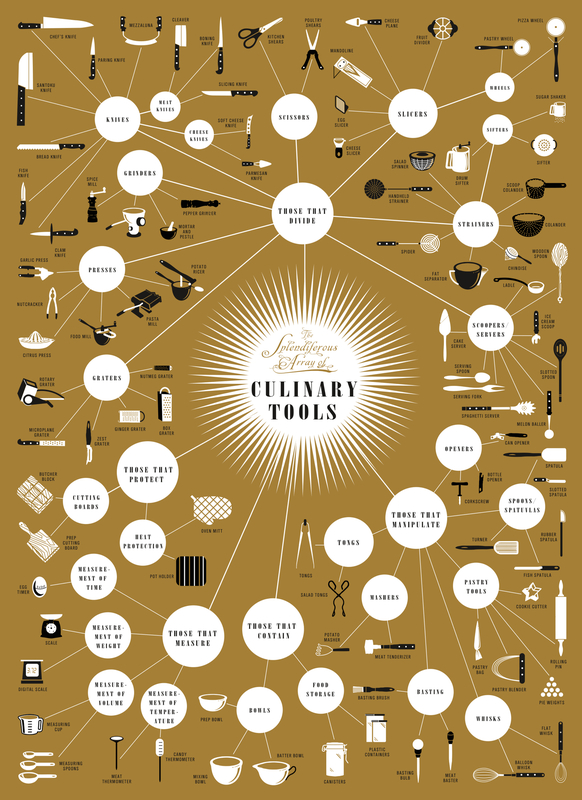 And check out this graphic to see what exactly makes up a “splendiferous array of culinary tools” ! Here you will find the big picture, as in outline, overview or summary, for some it may be the little picture, as in thumbnail, snapshot or essence – whatever it is, get your head around it – all warriors need an arsenal. Parchment paper will set you free. It’s a dishwasher in a box. I kid you not! No need to ever grease another pan as long as you both shall live! Nothing, and I mean nothing, will ever stick to another pan or dish on your watch again – ribs, wings, cookies, cinnamon buns, ooey, gooey casseroles – the list goes on and on. It can go in the oven, on the stove-top, in the microwave. It is the only thing to wrap food in that is headed for the freezer as it makes separation (the food) anxiety a distant memory. Not only is it waterproof and greaseproof, it will take on any shape after a little dampening. Needless to say – I LOVE PARCHMENT PAPER! Know this going in – the knife is the single most important and hard-working tool in your kitchen, besides you, of course! Like sticks to hockey players, batons to conductors and scissors to stylists – they will just feel right in your hand. 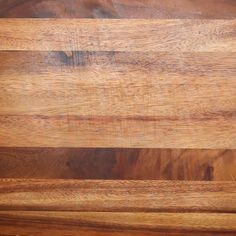 Like the Great One on the ice, or Mr. Bean at the “podium” or Sassoon at the salon, you’ll be choppin’, slicin’ and dicin’ with the best of them with the right knife, that speaks to you, on your cutting board. Afterall, when it comes to tools, even the masters would fall short without the right ones. And at the end of the day, isn’t the goal of all us crazed cooks to create glorious dishes with ease and precision without involving the Band-Aids! which knives do I need? what knife for what job? Enjoy the following information on how to use and care for the all the tools and equipment in your kitchen. I hate to admit it, but I own most of it – ok, ok – I own all of it. But remember I’m crazed and that’s my story and I’m sticking to it! what is a heat diffuser? how about a simmer mat? what are spatulas used for? Start with the basics – a couple of platters, a deep bowl, a shallow bowl, a bowl for salad – you know what you need, especially when you don’t have it. Depending on your cooking style, the food will lead you to your serveware. Days of the massive serveware sets our mothers dusted more than used are ova – choose what suits your style, and in my case, I serve all my cooking in delicious dishes. Stocking your bar in style is how collections are built – martini glasses, champagne flutes, wine glasses, beer glasses, shot glasses, openers & corkscrews – all designed to make the happy hour happier. Do check out the happy hour section for a fully-loaded, (some puns are simply too good to resist), all things hootchy collection for what to do with all that stylish ware in your bar. Hick, now that’s funny! Start with the basics. Duh! And you can never, ever, ever go wrong with white. I don’t think I’ve ever bought a “set” of dishes. When it comes to glassware – keep it simple. You know what you like, what your personality – and very often our personalities will come through in our choices. And choices is what you will have when you start shopping for glassware. Decide what your needs are and your needs will lead you to the right choices. The one-of-a-kind flavor that’s created by the barbecue, grill and smoker is just that – one-of-a-kind. You either cooked it on the barbeque or you didn’t. It was smoked, or it wasn’t. And thanks to the versatility of today’s barbecues – you can barbecue, grill and smoke using the same appliance. Don’t stop at the obvious – your barbecue can cook a heckuva lot more than serious man food – burgers, steaks, burgers, burgers, ribs, steaks & burgers. Why barbecueing circa 1950 was for men only is a question only a woman can answer. Back in the day, a man would guard the meat on the grill like he hunted it, killed, skinned it and turned it into burgers himself and therefore, “don’t touch my meat”. God forbid the little lady picked up the flipper and started messin’ with the meat. Fortunately, barbecueing has long ceased to be about gender and has become entirely about flavor regardless of who’s toying with the tongs. So heed my advice whatever the weather – wind, rain, hail, sleet or snow – the only thing stopping you from enjoying sensational outdoor cooking flavor is not the weather – it’s you. And by the way, almost all things edible can be cooked on the barbecue – how about soup & salad? If you fancy yourself a baker, a stand mixer should not be far behind. If you’re into smoothies a blender is just as important as the fruit. If you like soups to taste like you’ve added a vat of cream, a hand blender is indispensable. My point? Equipment that blends, purées, mixes, emulsifies, crushes and whips is something I want to have on my team. Check out the options, determine your needs and start pulverizing with the best of ’em – another secret in the cook-who-means-business arsenal. First – yes, a loaf of fabulous bread does a bread machine make. However, that’s simply the tip of the bread machine iceberg. When I realized that the machine could double as an extra pair of hard-working kneading hands, well, no bread was off limits. Make the dough in the machine, take it out and continue on to baguette heaven, or pizza dough greatness, or buns & breads with a twist – any bread beyond the loaf, is a batch of well-kneaded bread machine dough away. And if that’s not enough to get you going – how about jams, cakes, meatloaf, and even dog biscuits courtesy of your breadmaker. Shut up! No, you shut up! Available in small, medium and large – I’m talking juicers here. They can fit in your hand or you’ll need an extra power strip to fire it up. I too, have a range (of juicers), don’t get me started. First the hand-held variety when you want to juice a lemon, and an little electric model when I’m juicin’ a dozen. Don’t see the point? How about freshly squeezed OJ each and every morning and that alone should be enough to justify a sleek little electric model. Shamefully, I also have a compact juice “extractor” which is the newborn baby to any 200lb. industrial-style model (intended for those who would rather not use their teeth). When you realize (and you will) all the endless fruit/veggie combos to cure whatever ails you – the value of a cute little juicer will become perfectly clear. Happy juicing! Ya, ya, ya – I know, I know – deep frying is deadly. Ok, not deadly, but perhaps on par with smoking– unless you do it sparingly and, dare I say, correctly, which you can’t say about smoking – so perhaps it’s more in line with playing in traffic – don’t do it everyday and do it “correctly”. Back to the deep fryer – certain dishes are just not possible without the deep fryer – tempura, donuts, onion rings, french fries, calamari – and if proper oil and temperature are observed (that’s the doing it correctly part), it can actually be light years away from the greasy offerings of many a fast food joint. So get yourself some deep-frying know-how and put tempura back on the menu. These are absolutely and utterly indispensable – it’s like having extra burners on your stove, and I’m talking big burners and lots of them. I can create twice the cooking surface in my kitchen with the addition of frying pans, skillets and woks that and all I need is a plug. They do sound dated – electric frying pan – but they really are revolutionary. They have made huge design strides when it comes to electric cookware – wait for it – the pan is removable. I kid you not. Not only does it make cleaning up a breeze, a pan of sauced pasta, for instance, can be littered with grated cheese and then place under the broiler. The fact that I can remove the pan and then put it in the oven is like landing on the moon. So, get ready to take your moon buggy for a ride – life will never be the same again. What took hours and hours to accomplish only a few short years ago, is now done, at the flick of a switch. It does the work of a kitchen full of cooks madly wielding their knives. When I took my first food processor for a test drive, what can I say – the holy grail was mine. I’d never seen anything like it – the speed, the precision, the durability – it was like I had traded in my horse and buggy for the one with a motor. If you don’t have one, you need one. You will get sooooo much more pleasure for the mundane tasks that are required to produce delectable dishes – the chopping, the grating, the mincing, the julienning, the puréeing, not to mention the slicing, crushing, grinding and shredding. Processing food is unavoidable when cooking – my point? Make a parking space on your counter for this dependable work-horse-with-a-plug and never shy away from another gratin, minestrone or carrot cake, again. Some ovens come with them, the griddle, that is, which s very handy – a large hot flat surface to lay out those flapjacks like you’re running a truck stop. It can sauté vegetables, grill burgers, turn out grilled cheese sandwiches like a short order cook, even double as a hot plate. Cooking for a crowd just got a whole lot easier with a griddle to turn to. A waffle iron is another story and a wonderful thing to have. Mine is a hand-me-down from the 50’s – cast-iron, I never wash it (I wipe it) ’cause batters never stick – it has been a marriage made in waffle heaven. And when you realize that yes you can turn out delightful waffles on Sunday morning, you can also produce herb waffles ladled with creamed chicken or a spicy curry, corn waffles covered in chili or cheese waffles as a base for eggs benedict – the combos are endless. Ice cream makers need to make a comeback. They could not be easier to use. You just keep the insert in the freezer and you can have homemade ice cream made to order. These days, (unless you’re prepared to break the bank and buy real ice cream) the ingredients that can find their way into a batch of ice cream should be illegal. When you make it at home, you know what’s in it, you can control the ingredients and therefore control your health! The sugar and chemical levels of many store-bought brands, not to mention the fat, is enough to make your teeth ache and your pants feel tight. A basic ice cream maker is not expensive but will save you – many milks can get as creamy as cream – almond, soy, rice – yogurt will fool many and imagine enjoying ice cream on a regular basis without the head trip. This is one thing I can not, will not, refuse to live without. They have come along way from the teetering, tinkering rattlers that stood atop our grandmothers stoves. No need to worry if the chicken will end up on the ceiling. It is a new day in the land of pressure cooking, thank the Lord! I have a model that is a pressure cooker/slow cooker with the ability – wait for it –brown, sear and sizzle before you head to the pressure cooker/slow cooker mode. Rice never had so good. This may very well be the most adored, revered, admired and idolized appliance I’ve ever had the honour to get to know. It’s abilities knows no bounds. Load it up, turn it on and go away to come back to a meal that tastes like a load of sous chefs showed up while you weren’t looking to get the job done. Rule #1 – try not to grind coffee and spices in the same grinder. You can get away with one, but you must be diligent in the cleaning department. A quick whiz with a couple of tablespoons of white sugar or rice absorbs any residue, a quick wipe and you’ll be ready for next time. To truly appreciate freshly ground spices it only makes sense to devote a grinder to spices and a grinder to coffee. I have a couple for this very reason. You can’t beat the flavor of freshly ground spices – it wakes them up like nothing else can – it’s a culinary alarm clock like no other. The difference between spices that are processed at a factory and spices that are ground right under your nose is like the difference between cheez whiz and parmigiano reggiano – need I say more. Get grinding and discover what all the herbs and spices in your kitchen are really meant to taste like. Why is it, (for the most part), when buying store-bought plain yogurt – there’s really nothing plain about it , and I did say for the most part. And buyer beware is an understatement. Oh sure, the label say “organic” (read the ingredients), it boasts “100% natural” (read the ingredients), and together they become “all natural & organic”, (you got it, read the label). Throw in nonfat, low to no calorie, that’s right – read the label. I have spent many many minutes (I was going to say hours but that just sounded like I have entirely too much time on my hands) reading plain yogurt labels and have always wondered why sugar always makes an appearance. I don’t even bother with flavored options as the sugar content is very often halfway to ice cream. Soooooo, this led me to making my own. You can make yogurt in the oven, in a slow cooker in a homemade contraption involving heating pads and blankets, but with much digging I opted for the very reliable yogurt maker. You fill it and forget it and I mean forget it. I eat and use plain yogurt every single day so for me this makes sense. I can control the ingredients and the texture, play around with flavors and feel a little like a mad scientist while doing it. Nuff said.